Mark Pritchard certainly needs no introduction. From his time as one half of Global Communication, responsible for one of the finest ambient albums ever released, to various other projects, solo, with Tom Middleton or others (Jedi Knights, Reload, Link or Troubleman to name but a few), he has made an undeniable mark on electronic music. His latest project sees him remodel Harmonic 33 by adding a one between the threes and move away from the down tempo, library music-infused sound he has developed with Dave Brinkworth on the pair’s two albums to turn his attention to classic Detroit techno and eighties electro pop. This first H313 release is something of an audio-visual feast. Each track on EP1 is only identified as Problem 1-5 for the 12″ and Problem 1-6 for the digital version, with the real titles colour-coded. This is combined with a game on the H313 website, which, once all tracks have been correctly identified, gives access to an additional track, not available on any other format. Expanding on the playful aspect, Problem 1 sees Pritchard rewind time and land in the middle of a Speak & Spell exercise driven by the cold and robotic processed voice that terrorised legions of children into spelling correctly. Pritchard then deploys an 8-bit carpet of noises and bleeps which sounds like Kraftwerk on a day trip to a Pac-man nursery school. The heavy beat contrasts radically, bringing the pace down and giving the track a much more serious undertone. The second piece functions in pretty much the same way, minus the vocals, but here Pritchard integrates a short melodic pattern to lighten up the mood. Problem 3 and 4 clearly reference early nineties Detroit by applying different aspects of the scene to each piece. While the former rides on warm analogue waves, with occasional shaded vocals and a comatose groove as backbone, the latter is drenched in acid squelches and progresses lazily over its four minutes, recalling in part Luke Vibert’s I Love Acid of a few years back. The 12″ concludes with the short Speak & Spell outburst of Problem 5, while, on the digital version of the EP, Problem 6 reviews Problem 1 by removing all vocal content and revealing the piece in all its glory. The bonus track Problem 7, which is only available to download, for free, from the Harmonic 313 website once the six previous problems have been resolved, brings H313 right into the twenty first century by stamping a frisky dubstep beat over bleeps and deep granular noises. 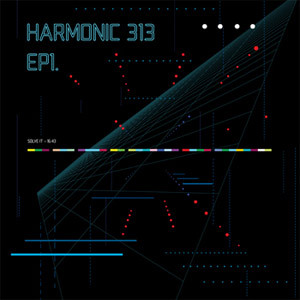 This first release as Harmonic 313 pays tribute to some of Mark Pritchard’s grounding roots. EP1 is a playful collection of electronic tracks which pave the way for a more expanded project, developed over the course of a full album, later on in the year.